Metallo (John Corben) was created when Professor Emmett Vale discovered Corben after Corben had a car crash. Vale was also an astronomer who had years before noticed Superman's star drive blaze through the skies. After years of searching, Vale had found the rocket's remains and taken the fragment of kryptonite lodged in it. He also decoded part of a message Jor-El left in the rocket and mistakenly believed Jor-El had hostile intentions. Vale repaired Corben, providing a robotic body powered primarily by the piece of kryptonite. After Vale told his story, Corben killed him and began a criminal career as Metallo. When Superman tried stopping him, Metallo exposed the kryptonite until being captured by agents of Lex Luthor. Luthor stole the kryptonite, thinking that would kill Metallo, but Metallo running on a backup power supply escaped from Luthor. After fighting the superhero team, the Doom Patrol, Metallo's body exploded and LexCorp regained control of his parts. When Luthor tried controlling Brainiac, Brainiac forced LexCorp employees to rebuild Metallo without using kryptonite. Later Cerberus provided Metallo with a new body. Afterwards, Metallo was altered by the demon Neron, and returned to Metropolis to see what he could gain from the new Superman Blue, but was defeated. Metallo's head was stolen from Stryker's Island by Luthor's men and Luthor tried to use Metallo to further ruin Superman's image in a devious plan, but was thwarted thanks to a counter-plan set up between Lois and Superman, which saw Metallo recaptured and his head encased in a glass container (AOS #568). Brainiac 13's arrival in Metropolis saw Metallo receive a hi-tech upgrade, which he used to attack Superman. 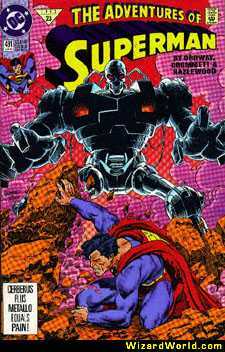 However together with the Metal Men, Superman was able to defeat Metallo (SUP #154). It was thought that Metallo, in his original human persona of John Corben, was the murderer of Thomas and Martha Wayne.�This was proven to be a hoax, part of an elaborate scheme concocted by Lex Luthor in order to further toy with Batman. Recently the 13-year-old from Japan who regards himself as the new Toyman, abducted John Corben, and transferred Metallo's brain into a biological body, claiming that the metallic body housing Metallo was property of his grandfather. The latest incarnation of Metallo still retains a Kryptonite heart, and now operates a giant robot. Time will tell if we see the return of the classic Metallo.